The October 23rd update has added a new camera mode called “Action Camera”. Enabling the new camera mode replaces the mouse cursor with a white cross-hair that is fixed to the middle of the screen. In effect, the mouse is used for moving the camera without having to click any buttons down. Clicking the mouse now initiates an attack on the targeted enemy. In other words, the Action Camera allows the mouse to behave similarly to the right thumb-stick on a controller. Notice the cross-hair in the center of the screen. To enable the Action Camera, simply open up the options menu and navigate to the controls tab. From there you need to scroll down to the camera settings until you see “Toggle Action Camera”. You can then bind this action to any key so that you can toggle in and out of the camera at will. I chose to bind the Action Camera to the “C” key. Customizing the following settings may provide you with a better Action Camera experience. In general, the best thing about the new Action Camera is that it provides a new way to experience combat in Guild Wars 2. You can essentially play the game as dedicated third-person adventure game. If you enjoy the first-person perspective, it makes the experience even more immersive. Another great thing about this new camera is that instead of back-peddling, you can now run backwards while still facing forward. This makes is much easier to quickly move away from targets. 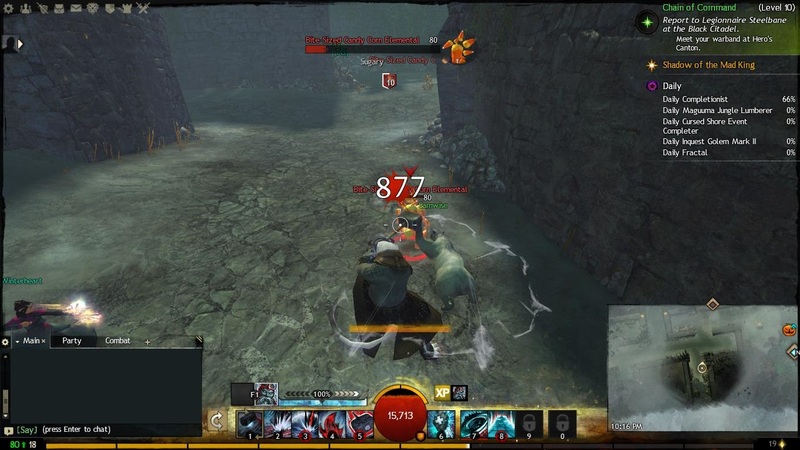 Finally, if you play Guild Wars 2 with a controller, the Action Camera is a natural fit since it allows for movement of the camera without having to press any buttons.